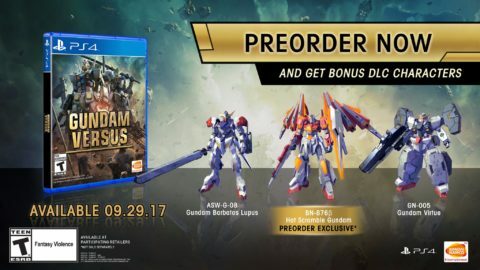 From the 2017 San Diego Comic Con Gundam Fighting Games Panel, Bandai Namco announced North American players (and probably Europe) will get to try out the Gundam Versus Open Beta on top of announcing pre-order bonuses prior to the September 29th release date. While there isn’t that much info on what the Open Beta entails and when it will start, it might follow the JP Trial version in terms of providing players with certain waves of playable units. As for the pre-order bonuses, all Western players who pre-order the game receive what Premium G Sound Edition players received when they pre-ordered that specific version. As always, we’ll let you know more information about the Open Beta when it arrives.